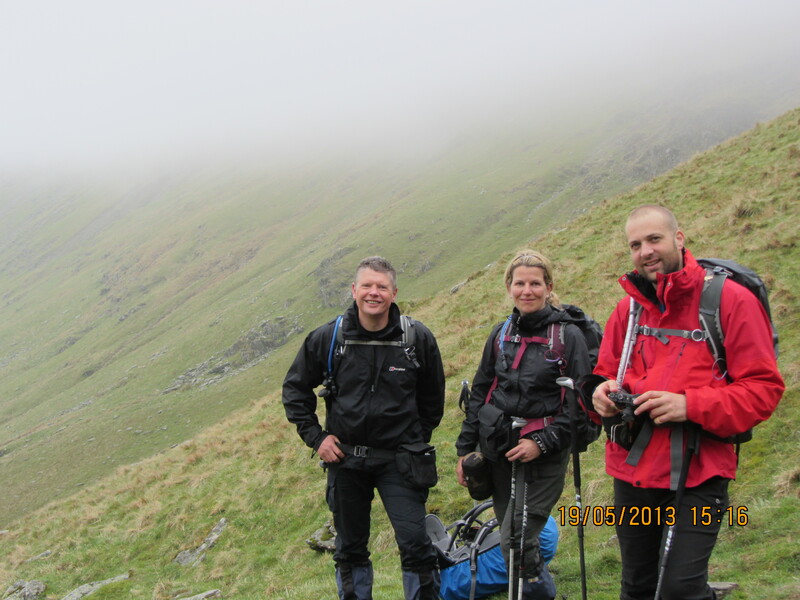 “I’m glad it was cloudy so I couldn’t see how much we had to do” said one of team after our 11.6 mile walk around the peaks of Kentmere in the southern eastern corner of the Lake District. It was a long, steady ascent up to the first peak and we were soon in the mist and getting damp. On came the waterproofs as we stopped for an early lunch. After sandwiches and a hot drink we began off along the ridgeline up and down the horseshoe of peaks. Visibility on top was no more than 25 meters, the ground damp and after while the path became hard to identify. Out came the maps, compass backed up by my trusty iPhone GPS app! Eventually we got ourselves fixed and back on the path as we descended to lower ground and below the cloud. We were now rewarded with stunning views of the Kentmere valley and the peaks we’d just traversed along. We completed the circuit tired but in good spirits. On the way home Jeff and I polished off Kendal mint cake and flapjacks after our long day in the hills. I’ve posted the climb stats and some photos on facebook.